An international team led by Indiana University researchers has uncovered the regulation of a system that allows a globally abundant bacterium to efficiently capture sunlight and perform photosynthesis. The study—led by IU biologist David M. Kehoe and conducted by Joseph E. Sanfilippo, IU Ph.D. student, and Animesh Shukla, former IU Ph.D. student, in collaboration with researchers in the United States and France—is the first to show how a process that improves light capture in marine cyanobacteria is regulated. The research also provides insight into how genes can be easily transferred between cells in the marine environment by a process called horizontal gene transfer. This is a common form of DNA movement involving genomic regions called "genome islands" that is important for the evolution of many organisms. The research is reported in the Proceedings of the National Academy of Sciences. The cyanobacterium Synechococcus is the second most common photosynthetic bacterium in the Earth's oceans. The IU study focused on how Synechococcus controls its ability to efficiently capture both blue and green light for photosynthesis. "It's important for us to understand more about marine cyanobacteria because they're a significant part of the base of the Earth's food chain," said Kehoe, professor in the IU Bloomington College of Arts and Sciences' Department of Biology. "Our planet essentially runs on power from the sun, and these organisms are important for converting sunlight into the organic compounds that are food for other species. We could not exist without these and other 'primary producers' because we can't create food from sunlight." In the marine environment, blue and green light penetrates the water column to different depths. In shallow coastal waters, many Synechococcus cells efficiently use green light for photosynthesis, while in deeper ocean waters, the bacteria maximize their capture and use of blue light. About one quarter of all marine Synechococcus examined so far can carry out this process, called "chromatic acclimation." Kehoe led an earlier study that provided the first mechanistic insights into this "chameleon-like" ability of many Synechococcus to capture blue and green light. The current study involved four groups of French and American scientists. "Our colleagues in France, who are excellent biological oceanographers, were intrigued by the molecular aspects of chromatic acclimation, while the American groups were intrigued by its ecological implications," said Kehoe, a molecular biologist. "We recognized that by combining our efforts, we could examine this process at many scales, from the molecular to the ecological. It's a truly collaborative, multidisciplinary project." The French group—led by Frédéric Partensky and Laurence Garczarek of the Pierre and Marie Curie University in Paris and CNRS Station Biologique in Roscoff, France—uncovered a genome island with six genes that correlated with the ability to undergo chromatic acclimation. Professor Wendy Schluchter and Ph.D. student Adam A. Nguyen at the University of New Orleans provided biochemical analyses for the study. Jonathan A. Karty, associate scientist in the IU Bloomington Department of Chemistry, contributed mass spectrometry results that were critical for the group's discoveries. Together, the group's results indicate that a small genome island confers the ability to undergo chromatic acclimation. If a particular strain of Synechococcus does not have the genome island, it cannot undergo chromatic acclimation. However, if a strain acquires the genome island, as one quarter of strains appear to have done, it will likely undergo chromatic acclimation. The group discovered that two genes, named fciA and fciB, located on the genome island are required to turn on and off the expression of the other genes on the genome island. 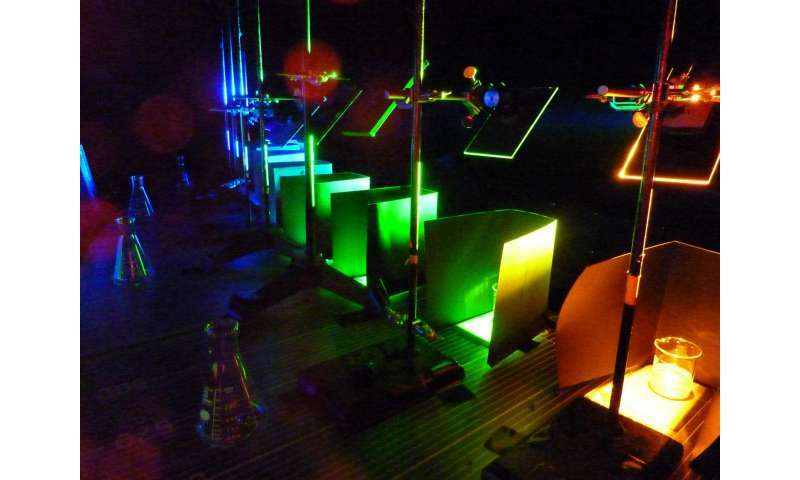 As a result, this genome island appears to be self-regulating and able to tune its own response to changes in surrounding light color environment. The results of this study provide important insight into regulation of horizontally transferred genes. Although the regulation must be correct when such genes enter a new organism, regulatory genes are often not located near the genes they regulate in a genome. "We found that this genome island includes both types of genes, making it self-contained by allowing the proper regulation of this process to be provided along with the capacity for chromatic acclimation. We predict that this facilitates its spread in the environment," Kehoe said.